The 4.5inch Howitzer was in service at the outbreak of World War I. Developed from lessons learned in the Boar war, it was at that time considered to be possibly the best weapon of its class in the world. Originally with spoked wheels and drawn by 6 horses these were replaced in the 1930's as artillery started to become towed, or mechanized if you like. Originally fitted with Mk R1 Solid Rubber Tyres these were replaced with Mk 1P pneumatic tyres which were added to both gun and limber. At the outbreak of the 2nd World War, the gun saw service with the BEF in France, although all these weapons were lost in the subsequent retreat. Some 400 guns remained throughout the Commonwealth being used by Australia, South Africa, Canada and New Zealand as well as those remaining in British service. The weapon was used during 1940 to 1941 in the Western Desert Campaign until replaced by the 25pdr Field Gun. This latest release by Resicast brings us another unique kit in 1/35 scale. The model was Mastered by George Moore and provides both Gun, Limber and ammunition in the set. The kit comes in the standard Resicast well packed cardboard box. On the outside is a picture of the built, but unpainted model complete with product information and manufactures details. The kit is cast in a light grey resin and was free from any noticeable damage. It contains parts for the 4.5inch Howitzer, Limber and a brass PE fret for 3 ammo panniers, plus a small selection of brass shells. The instruction booklet is in A5 size, consisting of 20 A5 pages, outlining the build steps in a logical and easy to follow fashion. Page 1 of the booklet has 2 B & W photos, one of the Howitzer and one of the Howitzer and limber. The build instructions are also available as a pdf file if you choose to contact Graham at Resicast. One thing I particularly like about Resicast kits is the parts listing on page 2/3 indentifying what the bits actually are. Building gets under way on page 3 with the gun assembly and runs to page 11. This is followed by 4 pages of build instructions for the Limber and panniers. A page of drawings of various parts of the weapon follows this and the remaining pages are given over to 3 photographs of the WWI version showing the breach and fittings, and 2 of the upgraded WWII version. The parts are all clearly numbered and matched against the pictorial build instructions. The parts themselves are beautifully done and the barrel tube comes pre drilled. They will require minimal clean up as there is some flash to be removed along with the pour stubs, but nothing major. The body of the Limber comes cast as a whole and has the option of open or closed doors. Precast ammo panniers are visible with one or two empty racks for added effect. I am not an artillery expert and have limited references for the weapon but I know George Moore who mastered the piece and the standard of his research and dedication to the hobby. Everything I’ve look at tells me this is an accurate kit, displaying fine detail and I can’t see anything missing on either the Gun or Limber. Some of the parts are quite tiny and will require careful handling but you have here all the makings of an unusual and interesting artillery piece that provided useful, and probably critical, service for Commonwealth Forces in the early years of WWII. The addition of the shells, casings and panniers round off what should build into an excellent model. This is another terrific kit form Resicast, well cast with excellent detail. The arrival of this kit, I am sure, will be welcomed by many. I never cease to be amazed at the detail, or excited by the arrival, of a new Resicast kit and this one will not disappoint. The kit provides a previously unavailable kit, which in itself is highly commendable , but it also fills part of the gap in available British Artillery pieces, particularly for the early war years. 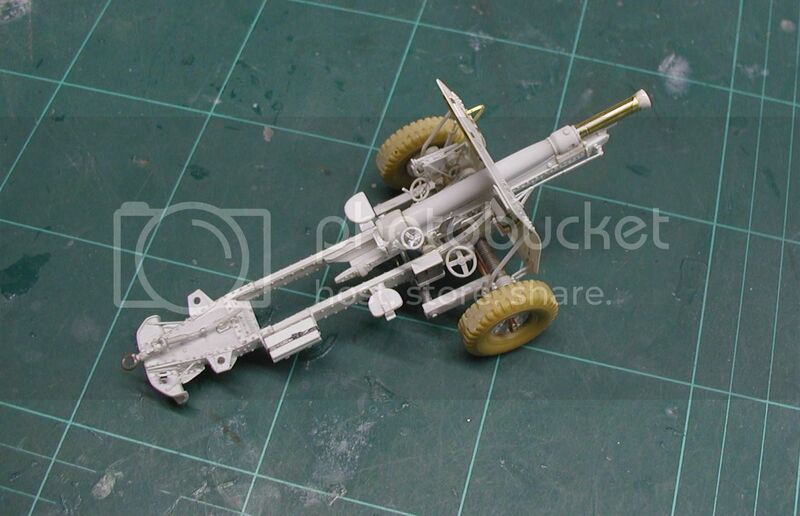 It is also a ‘small’ howitzer and as such has great diorama potential. Either built as a standalone kit or incorporated into something larger builders should thoroughly enjoy this kit. For Artillery enthusiasts this will be a major addition to their collection options. An excellent addition both for the modelling community and to Resicast’s growing range of unique artillery pieces. Normal precautions apply when working with resin. Highs: Excellent detail and beautifully cast, another unique and interesting model. Thank you for the review Alan, could this be followed by the 6inch version? Would this be something a Quad tractor could pull? I picked up the Tamiya Quad tractor for a song, but don't feel particularly like fixing the gun that goes with it. This or the 18-pounder would be perfect. Bill I have full access to the real thing so if you wait there will be a walk around of the Quad soon. Hi all and thanks for the review. To answer some questions, the Morris and Guy FAT were the basic towing vehicles for this period, though the use by Commonwealth forces may prove me wrong, (not unusual)! The picture in the respnses, shows the 18/25 pdr, of the same era. This is still being worked on as it is quite complicated. The WWI 18pdr field gun, converted for use with the BEF and Commonwealth forces, these were fitted with rubber tyres, has reached pre-production, just waiting for test batch of the few etched brass parts. And yes, a 6" howitzer is on the stocks, it is a bout 75% finished, but I am searching for details of the axle/wheels and brakes on the later pattern. The example here in the UK is a WWI conversion, and the axle mountings and brakes are very complicated. I did a complete photo shoot at the RA Museum at Woolwich. Thanks again for the nice comments Alan, you in Plymouth again this year ?? George.